Wedding PR: Social Tables, WeddingIQ, Catersource and more! Happy Monday! We’ve got a great lineup of client features for you, including Social Tables, WeddingIQ, Catersource, and so much more. Keep scrolling to check it all out! 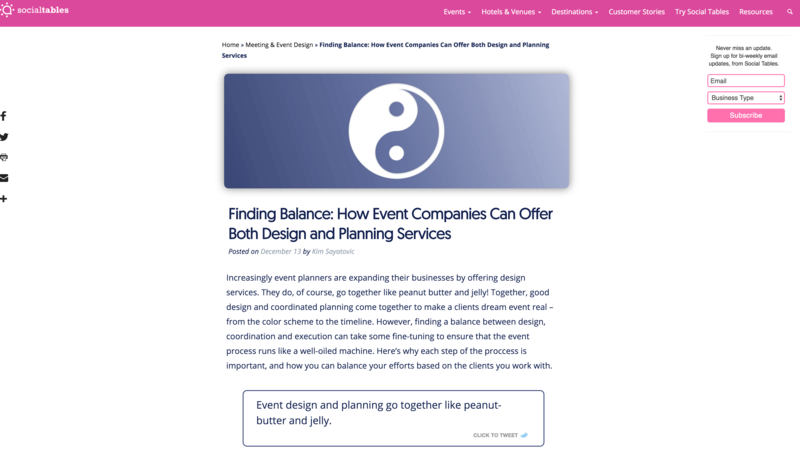 Belladeux Event Design was featured on Social Tables with her guest article Finding Balance: How Event Companies Can Offer Both Design and Planning Services. See the full feature here. Taylor’d Events Group was featured on Social Tables with her guest article So, You Have to Cancel Your Event. Now What? See the full article here. Fantasy Sound Event Services was featured on Social Tables with their guest article 7 Productivity Apps that Event Planners Use Daily. See the full article here. Cocoon Events Management Group was featured on Social Tables with their guest article 3 Event Decor Principles That Make Ordinary Events Memorable. See the full article here. OFD Consulting was featured on Social Tables with her guest article 5 Tips to Elevate Your Event Planning Business with Partnership Marketing. See the full article here. Belladeux Event Design was featured on Social Tables with her guest article Why Your 2017 Goal Should Be to Stay on Trend. See the full article here. OFD Consulting was featured on Special Events with her guest article Wedding Distributors: Who to Watch in 2017. See the full article here. Taylor’d Events Group was featured on Catersource with her guest article Risky Business: The Key to Being Prepared. See the full article here.